This snack was created by me for my love of chillies!! I know some of you cant handle the heat so you can substitute the chillies with either strips of capsicum or a milder green chilli. Its an excellent snack which you can serve at your parties or even for a high tea!!! Serve it with a shop bought sauce or a mixture of sauces or green chutney!! YUMMY!!! mix the mashed potatoes with the cumin seeds, chaat masala or lemon juice, coriander leaves and salt. Add the breadcrumbs and mix well. Take a small ball of mashed potato mixture and flatten it well. Place the green chilli half in it and seal it by folding it in your palms. Press it a bit to make a nice oval shape and neaten it by shaping it. Make all of them the same way and roll in breadcrumbs. Heat the oil well and deep fry these coated chillies!! Serve with sauce of your choice!!! ENJOY!! TIP: sent to me by Lata Pessumal…. you can use boiled baby corn instead of green chillies…marinate it in a few spices and the lemon juice and then cover them with the potato mixture..THANK YOU LATA!! 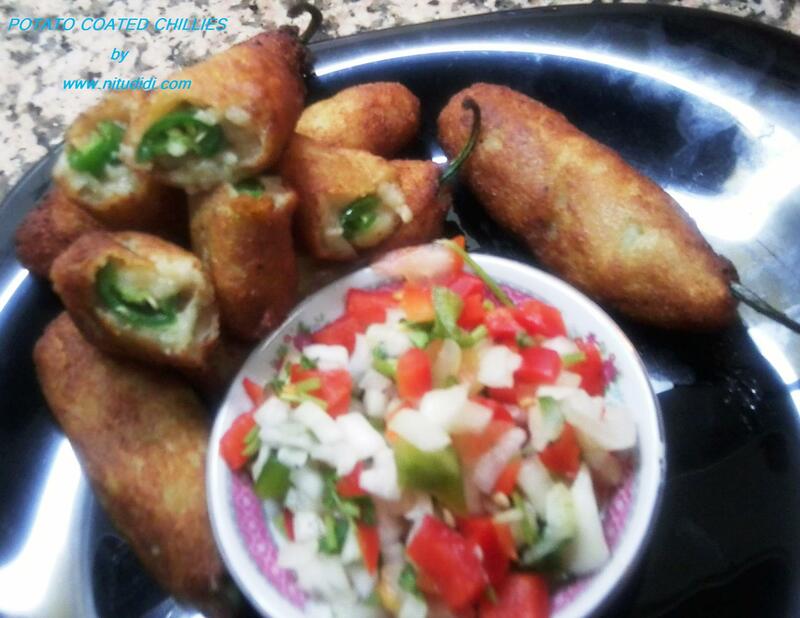 This entry was posted in Everything Vegetarian, Nitu´s Spicy Delights, Veg Starters and tagged breadcrumbs, chillies, potatoes, spicy, veg snack. Bookmark the permalink. Hi, thanks for the recipe as im a fan of chillies. Rubab your most welcome!!! i love chillies too! !